It started maybe 2 weeks ago, Ethan and I noticed this loud chirping from outside and didn’t think anything of it because that’s what birds do. 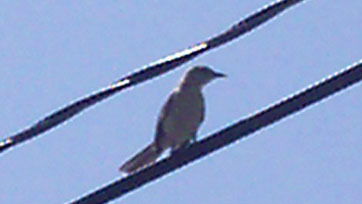 Then we started to notice that the loud chirping would go on for extended amounts of time. Next we became aware that it was only when our cat, Clyde, was outside. 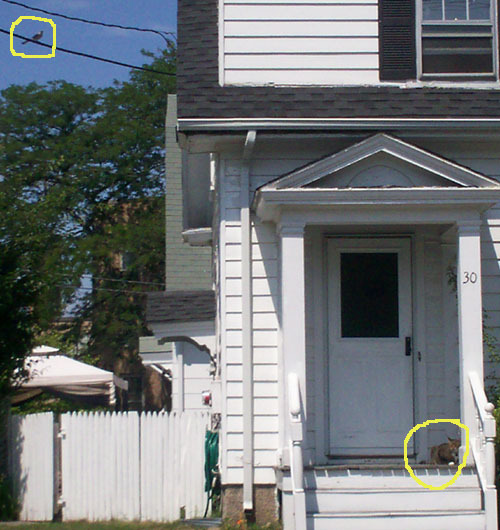 We’d see that when Clyde was sitting on the front steps, the bird would sit on the closest telephone wire and stay there chirping. If Clyde walked across the street the bird would move over to a wire or a branch across the street and continue the harassment. Anywhere Clyde went, so would the bird. 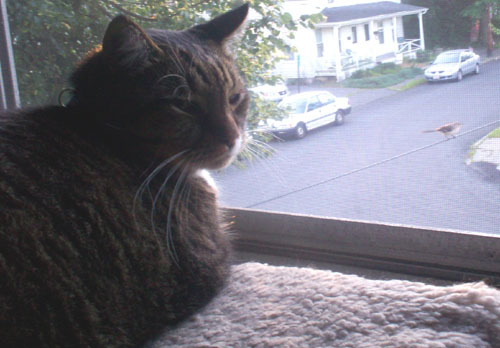 Now even if Clyde is sitting in our window, the bird comes over and starts chirping. This isn’t a little tweetie bird chirp either, it sounds like the sharp noise a smoke detector makes when it’s battery is low. So, the other day Clyde was out and went around the back of the house. Of course the bird followed him and I don’t know exactly what happened but Clyde came running from around the corner with the bird flying right next to him. Clyde ran up the stairs to the front door and I let him in. He just sulked around the house for the rest of the day and when I offered for him to go out he just stood in the doorway. Now he’ll just sit on the front step but won’t venture much further because the bird is even worse now and it will take dives at him. Here’s a photo (with his commentary) Ethan took of the little guy we found the bird is protecting. Cute, but it’s depressing Clyde that he can’t enjoy going outside like he used to. Too bad he’s a big wimp and won’t defend himself. Note: I just wanted to apologize for the fact that my camera is a piece of junk. The top photo here was the last straw, so I’m saving up for an upgrade. 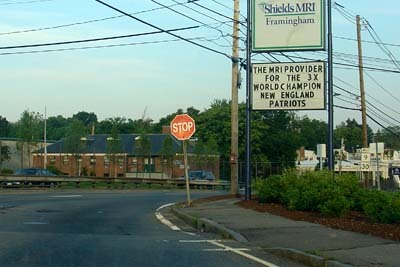 The only accident I’ve even been in was at this stop sign a few years ago. It was my fault. The person in front of me started to go and then I looked back at route 9 to make sure it was clear, and it was, so as I turned forward I started to step on the gas only to find the Durango in front of me stopped after initially moving and I rear-ended it at a whopping 1 mile an hour. I was more than apologetic but this lady was mean and dramatic acting like I came wailing into her at 80mph while drunk, on a cell phone and eating a bag of chips. When the police officer got there and was telling her I gave him my insurance info, she looked at me and then at him, put her hand on her hip and said “Oh, you mean she HAS insurance?” I’m not really sure what that was supposed to mean, isn’t it the law to have insurance for MA plate car? Did I look like some scrub that was trying to drive with an uninsured, MA plate car? The officer, who was really nice, told me that stop sign is the one of the top places (if not the top) in Framingham for accidents. This lady got $20,000 for her sore neck (mind you, I was in my little econo car and bumped her towering Dodge Durango) but then tried to get MORE money from my insurance company and that’s when it become known that she was in an identical accident at the SAME exact stop sign a week earlier and got money from that person’s insurance too. Hmm…stopping short to get $20,000 is a pretty good plan if you are a total sleazebag. 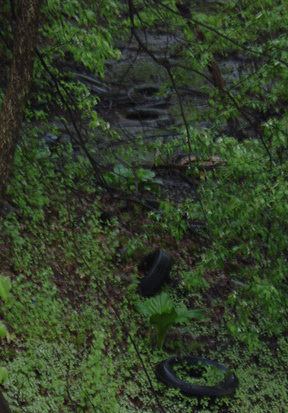 as part of my route and I noticed about 7-10 tires just thrown into the woods visible from the sidewalk. These are just across the street form the yard waste drop-off and a mere few seconds drive down the street to the town recycle plant where people can properly dispose of them for $4 a piece. After a few months of watching them get rained on, covered in autumn leaves, snowed on and then thawed out again I figured maybe the town should take them away seeing that not only does it look dumb but mosquitoes are known to breed in water-holding tires in the spring. After a few weeks, I checked in to see what the status was and I received an email telling me that 14 tires were removed in the same exact location and where are tires I was writing about. Thinking they must have taken care of the tires, I went down there excited to see a clean area, but all of the tires I wrote about were still half-sunk or resting in the mud. How could they miss 7-10 tires in the same exact area? So I told them they were still there and I could show someone where they are if need be but I was told they would look into it because it’s conservation land. 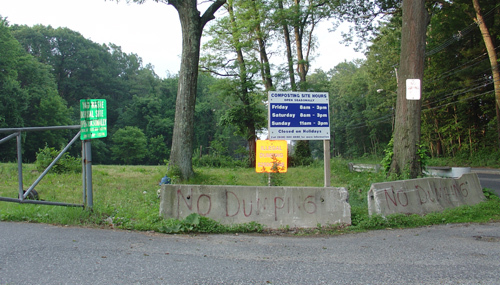 Last I was told, the Conservation Commission (since it’s on their land) is working on legal action against one of the “abutters contributing to the problem”, and a clean up date has not been set.